Mention plastic cars, and most people think of the leaky, creaky and crazed bodywork so common on glass fibre cars of the 1960s. Where plastics are used High wear areashave two-packpolyurethanepaint reinforcedwithmicroscopicpolyester balls. Hot mouldedpre-impregnatedglass fibrematting. Injected polyestersurrounding glassfibre matting. Rigid polyesterfoam with metalreinforcementsandwichedbetween polyestersheets. Plastics and other composite materials are in widespread use for outer panels and on occasion, complete bodyshells. Materials most likely to be used for bumpers are types of thermoplastic or polypropylene. Rigid materials like glass reinforced plastic and reinforced polyester are better for body panels. The Renault Espace uses plastic body panels mounted on a zinc-protected steel chassis frame. Plastic still has a poor image even today, being connected more with flimsy toys than the leading edge of motor industry technology. But plastics are becoming increasingly used in making cars, largely as a result of the drive towards weight reduction for lower fuel consumption and greater economy. For many years the problem has been that plastics are not strong enough to be used without reinforcement. Now the scene is changing, with more complicated, composite materials taking over from simple plastics. These new materials bring changes in design and manufacturing processes but, most of all, offer greater driving economy. The Michelin VMP 413 plastic tyre valve is lighter than a traditional metal valve and has only four moving components —three snap-together plastic parts and a metal spring. The plastic is a man-made resin called Delrin. The valve holds air better at high rotational speeds and has less effect on wheel balance than a conventional steel and brass valve. In reaction injection moulding, two types of liquid plastic are injected at the same time. These react chemically and set hard inside the mould. The process is very fast, taking only about 90 seconds to complete each panel. The wings and bqmpers of the Reliant Scimitar SS1 are made in this way, but they have additional refinement—glass fibre matting is laid into the mould first and the liquid plastic squeezed in around it. Reinforced reaction injection mouldings (RRIM) can be made to be very flexible while retaining high strength. Glass fibre - more correctly known as GRP, which stands for glass-reinforced polyester - combines lightness with strength. Weight for weight, glass fibre is much stronger than steel, so the panels can be made lighter. For many years it was the only plastics material used for structural car parts, and it is still widely used today. In a glass fibre bodyshell, glass fibre matting is used to reinforce a polyester or epoxy resin panel. The resulting material is relatively stiff, but still has sufficient 'give' to withstand low-speed knocks. 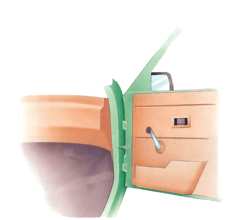 In the 1950s, manufacturers started to use the material for car bodies. The first car to appear with a glass fibre body was the Chevrolet Corvette of 1957, but underneath it still used a conventional steel chassis to give it strength. The following year, Lotus introduced the original Elite - the world's first, all-glass fibre monocoque. It had no steel chassis, and the engine, gearbox and suspension were bolted directly into the glass fibre shell. Among the cars currently in production with this construction is the Midas, a low-volume specialist car that takes much of its running gear from the BL Mini and Metro. As an alternative to steel, glass fibre construction has considerable advantages. Though of much thicker section the structure is light, and rust becomes a thing of the past (except where it is bolted to metal). For the manufacturer, tooling costs are lower than for car construction in steel because large presses are not usually needed. Despite the advantages, glass fibre cars have only been produced by small manufacturers, usually attracted by the low tooling costs. For mass production, it has never really been a viable proposition. Manufacturing is relatively slow, since each body section needs to cure for a couple of hours. Car body manufacture in steel, on the other hand, has had the benefit of much more investment and development. Glass fibre can be made in a single-piece 'open' mould or in a two-piece press. With the open mould, only one side of the finished panel will have a good finish, but the mould is easy to make. This technique is normally only used for making one-off panels at home. Using a two-piece mould results in an accurately sized panel which is smooth on both sides and of consistent thickness and quality with little risk of air bubbles. Most car body panels are made in two-piece moulds. The woven glass fibre matting is laid into the lower half of the mould, then the second part is dropped down on top and locked in place. Liquid epoxy or polyester resin is pumped into the mould. After about an hour, the glass fibre moulding will have cured and the mould can be separated. Lotus, who use the two-piece mould technique but use steel and Kevlar reinforcement as well as glass fibre, make their bodies in two main parts—an upper and lower half—which are glued together after moulding. Lotus also use glass fibre-wrapped foam sections in the mould to form rigid box sections for the body sills and other areas that need greater strength. The BX bonnet and tailgate are made from polyester resins. Reinforcement to add rigidity comes from webs moulded on to the bonnet's underside and moulded-in long strand glass fibres. After manufacture, the panels are painted to match the bodyshell. Since the early days of glass fibre, the use of plastics and other composites has come a long way, with techniques such as reaction injection moulding allowing a much faster manufacturing cycle. Most manufacturers now use some form of plastic for the bumpers of their cars. In the early days of plastics, the bumper moulding would have been a single piece of ugly heavy-gauge plastic (polypropylene or thermoplastic) in black or grey, usually with metal reinforcement behind to give adequate strength and resistance to sagging. These are moulded around a foam core to form a strong box section. A metal former behind adds more strength. Nowadays the strength is more likely to come from moulded-in box sections: a piece of lightweight foam is used as a base, around which the rest of the bumper is moulded. The foam has no real strength of its own, but when it is used as a spacer it moulds the plastic into a strong 'hollow' section. Rover make the bumpers of the 800 series in this way but Lotus have developed the technique to the extent that they can use it for the main structural sections of their car bodies. Steel parts can also be moulded-in to give localized reinforcement for door hinge or lock mounting, and for protective parts such as door girders and roll bars. Many of the plastic-bodied cars in production now use different types of plastic for different parts. Bumpers need to be deformable to absorb impact, and elastic to avoid permanent damage, so they are made from a variety of specially modified plastics with some rubber-like properties (such as polypropylene or modified thermoplastic polyester). For panels like the boot lid it's better to use more rigid material such as fairly heavy gauge glass fibre or cold-pressed reinforced polyester so that the driver feels solidness when slamming it. To aid reduction of the noise generated by the diesel engine, the sump is made from a steel-plastic-steel laminate. Using many different materials is easy to arrange if the body is made up from a number of different parts bolted to a central structure, but Lotus, who make their bodies in two main parts, manage to combine several different materials into the same casting. With vehicles that have individual panels bolted on to a separate steel frame, such as the Reliant Kitten and Scimitar and the Renault Espace, each panel may be made of only one material or a composite of two. Provided that all the different materials used can be made to accept the same type of paint system, there will be no problems with finish. Because of the bolt-on multi-panel construction, different panels can be of different materials, depending on the jobs they have to do. The bumpers and wings are made from semi-flexible reinforced reaction injection moulded polyester to minimise damage from small knocks. The doors, bootlid and other panels can be more rigid, and are made from reinforced polyester pressings. The fireproof bonnet is made from vacuum-assisted injection moulded polyester sandwiched with rigid urethane. Glass-reinforced polyester will take conventional paint, as will other materials such as rigid polyester, used for non-flexible body parts. 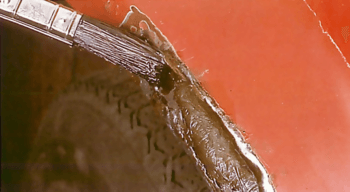 Most plastics cannot withstand paint-bake temperatures, however, so a common way around the problem is to use a two-component paint system that sets by chemical reaction rather than with heat. Renault use this type of paint system for the Espace, which also has minute balls of polyester incorporated into the paint for high-wear areas such as the lower panels, which are prone to attack from dirt, grit and stone chippings. It is not possible to self-colour high-density polyurethane and conventional paint won't stick on it, so many of the early bumpers were unattractive. Since then, new materials and special primers have been introduced which allow the bumpers to be coloured. The bumpers of the Austin Maestro and Montego, which are made from PBT (polybutadiene teraphthalate), are sprayed at the same time as the body to ensure good colour matching. They are painted away from the body and then fitted. This glass fibre reinforced polyester leaf spring is used on some Sherpa vans. The spring is fully moulded so it is smooth all over. It is of varying cross-section and has the eye at each end clamped in place by steel shackles. Although plastics are being used more and more for body parts and small components, recent advances have meant that plastics could soon be in widespread use for more major components. Glass fibre leaf springs have already been used on the 1980s Chevrolet Corvette and in the Sherpa van. This technique is used where rigid, accurately finished panels with good surface quality are needed. The bottom half of the mould is coated with polyester resin, then pre-shaped pieces of continuous filament glass fibre are laid in on top. The mould is closed and catalyzed fire-resistant resin is injected under pressure. This works its way through the glass fibre and reacts with the polyester resin to set hard. Fibre-reinforced plastics are also being developed for use in engines - not just for pipework, insulation and filler caps, but for items such as pistons and connecting rods. Significant weight reductions can be made with materials other than the heavy cast iron and steels currently in wide use. But rather than suddenly arriving at an all-plastics engine, the new materials will continue to be introduced for individual components only, until plastics gain more widespread acceptance.